Adele’s plate, and resulting print. Instructor Kacie looks on. Dates: Monday, June 1, 8 & 15, 2013. All supplies will be provided. Workshop Description: Monoprinting is a printing technique whereby a design is drawn onto a flat non-porous surface, also referred to as a printing plate. Paper is laid on top and after pressing, the image from the plate is transferred onto the paper. Monoprinting, as the name suggests, is when you create on unique print (rather than having a plate or a screen with an image which can be reproduced again and again). There are a number of different ways to make a monoprint, but in this workshop students will learn three different methods of monoprinting while focusing on basic drawing and painting techniques. Students will learn how to use variety of tools and found material e.g. leaf, lace, ribbons, and different textural papers etc. Students will learn how to create a good composition and explore a variety of techniques and mediums that allow for creative expression in a fun and supportive atmosphere. 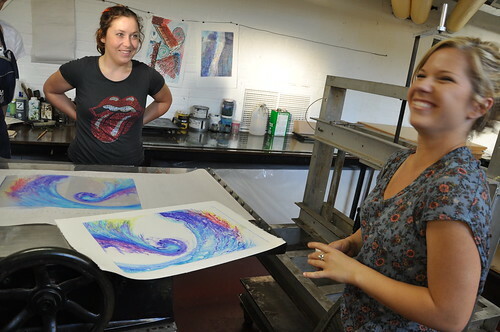 For more information on Kacie’s past Monoprinting workshop, read this article. This entry was posted in News, Workshops, Workshops - Adult/Senior, Workshops - Teen/Adult/Senior. Bookmark the permalink.